Colour is nature’s way of advertising a food’s inherent “goodness”, which is why it is important for us to incorporate a varied rainbow of fruits and vegetables in our diet every single day. This provides us with vitamins, minerals, antioxidants and fibre; which are all crucial for our general wellbeing and help with disease prevention. This tasty plant-based meal contains a whopping SEVEN different brightly coloured vegetables and interestingly, did you know that three tbsp of puy lentils also actually count as one of your five a day?! 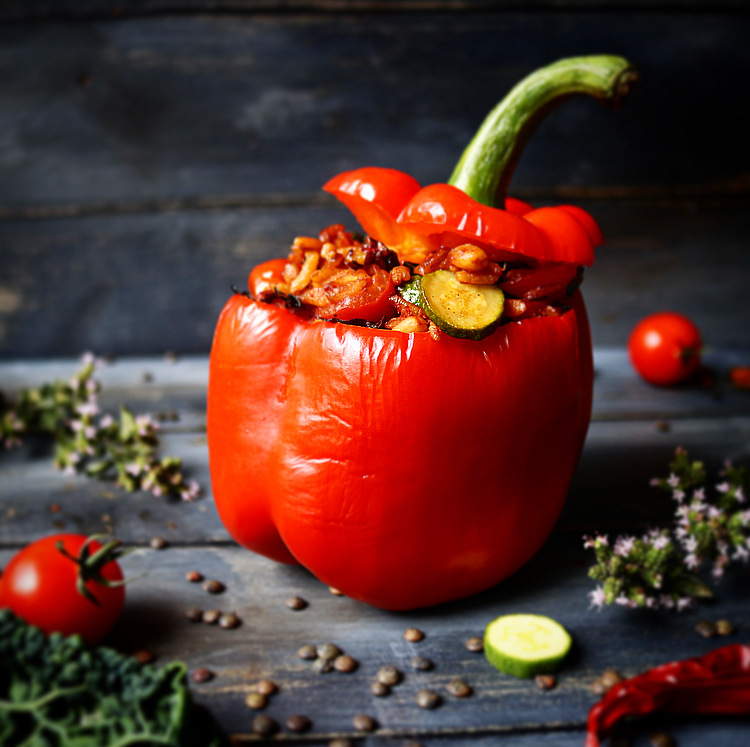 Because of this, these stuffed peppers are a wonderful source of a whole host of micronutrients, which is perfect preparation for the colder climate and the inevitable onslaught of germs entering the house. It is so easy to prepare, and I tend to make double batches as they can be kept for several days in the fridge and then easily reheated in the oven. It is so versatile and can be used in several different ways. It is a great stand-alone vegan dish, for either lunch or for dinner. But it is also delicious with a generous crumbling of goats cheese on top, as a tasty meat-free meal. It also serves as a wonderful side dish to a piece of simple grilled salmon or chicken. And lastly, it can be enjoyed cold for lunch with a drizzling of balsamic vinegar, like a roasted veggie and lentil salad in it’s own pepper bowl! One portion provides 304 calories, 15g of plant-based protein and half of my daily fibre. It also provides a massive 144% and 328% of my Vitamin A and Vitamin C requirements respectively, as well as 17% of my Iron. So all in all, it is an incredibly flavoursome, easy to make and healthy versatile meal. NOTE: Feel free to change up and substitute the veggies depending on what’s in season or what’s about to go off in your fridge! · Cut the tops off the red peppers and clean out the pith and seeds from the inside. · Dice the onions and leeks. · Chop the courgettes into small cubes. · Place the red peppers on a roasting tray and bake in the oven for 20-30 minutes until softened but not too soft. · While the peppers are cooking, heat the oil in a large frying pan, and fry the onions and leeks over a medium heat until just starting to brown. · Add the courgettes for a few more minutes before adding the kale and tomatoes. · Add the smoked paprika and season with salt, pepper and chilli flakes if using. · Sauté until the tomatoes have softened. · Add the cooked puy lentils and combine well. · Remove the peppers from the oven and carefully spoon the vegetable lentil mixture inside. · Either serve immediately or cool before putting in the fridge in an airtight container. Simply reheat in the oven for half an hour.